Today, we’re looking at Flux – a futuristic yet simplistic slot machine in both its looks and gameplay features. The title was designed by Thunderkick and has clearly been created for those looking for a slot that doesn’t try to impress with flamboyant bonus features or cutting-edge graphics. In terms of specifics, Flux is played on a five row, three reel gameboard. The title’s one and only special feature is a free spin mode. During this, the grid can expand, and/or additional win lines can become active. Great futuristic music suits the overall ethereal vibe. We thought the soundtrack resembles a Muse album intro! Nice approach to a free spins mode. Giving players different options on a Bonus Game really increases the replay value of a slot machine. Sparse visuals and little animation. Flux might appeal to those who like the very simplest games around, but many will find it gets stale quickly. Despite a creative Bonus Game, the special features on Flux are rather uninspiring. With its lack of creativity on the artwork front combined with its dull gameplay, players who don’t want to see all three free spins modes in action will likely get bored fast. The top jackpots on the Flux slot machine are all awarded for hitting five-of-a-kind down one of the 15 (or 30) win lines. 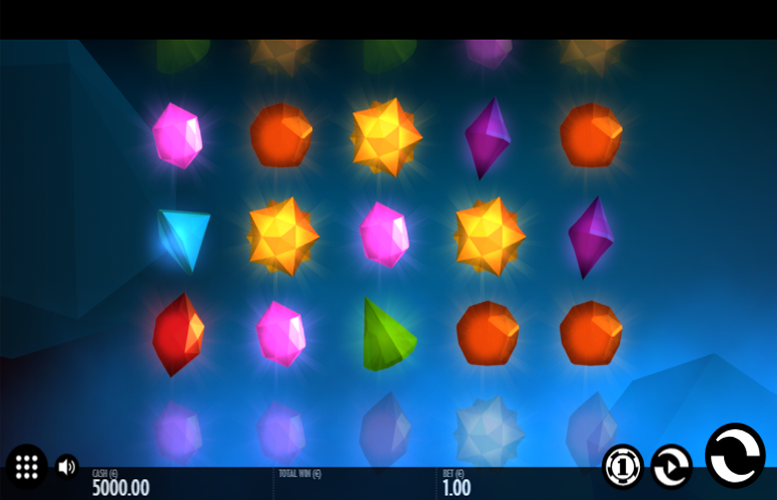 The symbols chosen for these higher value icons are all brightly coloured shapes that resemble gemstones. Were not sure of the significance of these to the game’s loose theme but they look kind of cool! Yellow gem = 24x the total bet. Orange gem = 12x the total bet. 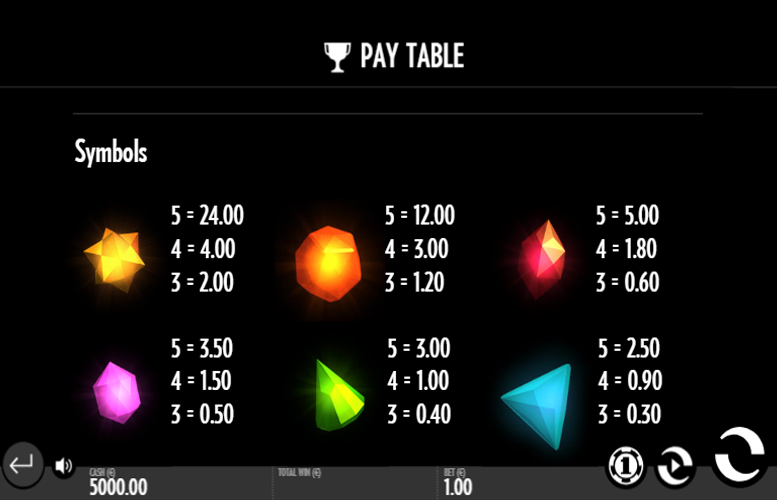 Red gem = 5x the total bet. Pink gem = 3.5x the total bet. Green gem = 3x the total bet. Light blue gem = 2.5x the total bet. Purple gem = 2.2x the total bet. Dark blue gem = 2x the total bet. You’ll find that bigger wins are available on free spins / bonus game feature. 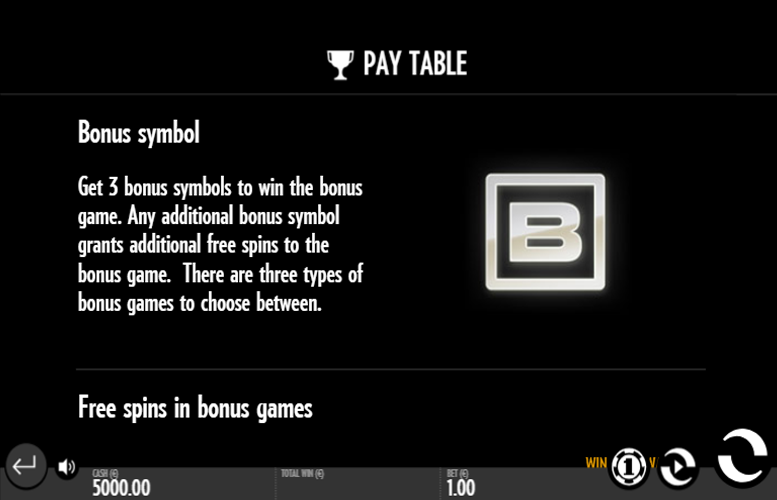 Three “B” symbols = 16 “Win Both Ways” spins, 12 “Three Extra Rows” spins, or 8 “Win Both Ways and Three Extra Rows” spins. Four “B” symbols = 32 “Win Both Ways” spins, 24 “Three Extra Rows” spins, or 16 “Win Both Ways and Three Extra Rows” spins. Five “B” symbols = 48 “Win Both Ways” spins, 36 “Three Extra Rows” spins, or 16 “Win Both ways and Three Extra Rows” spins. 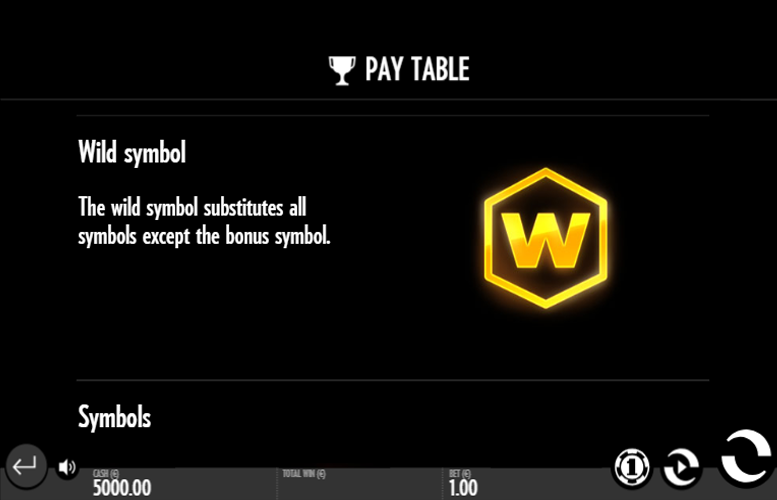 The “Win Both Ways” spins mode activates an additional 15 win lines that mirror those during the base game. As well as running left to right, they run right to left. The “Three Extra Rows” spins mode does just what the name suggests – adds three additional rows of symbols to the gameboard. This allows for greater chances to win big! The “Win Both Ways and Three Extra Rows” free spins mode is a combination of the two previously mentioned features. Both are active at the same time when selecting this option. In terms of betting limits and distribution, players are not given a great scope for spreading their wagers around on Flux. Many slot machines these days include options to vary the number of win lines and the amount bet on each one. Thunderkick have simplified this on most of their slot machines. Unfortunately, this comes at the cost of some control over the action. 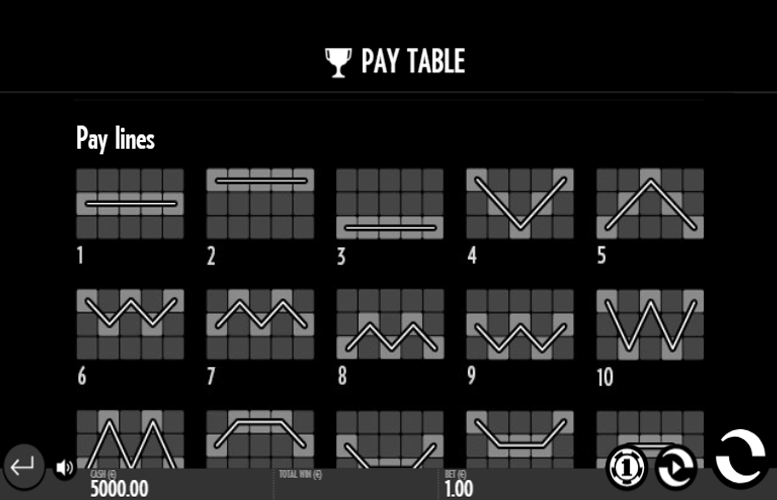 Players must select their total bet amount that is divided across all 15 (or 30) win lines. The values range from just 10p to a decently sized £100. We think this should suit all but the highest rollers around. All told, the Flux slot machine from Thunderkick isn’t the most exciting we’ve ever played. Neither the gameplay itself or the art style were the standout feature for the title – we were most impressed by the music. That said, we came to play slot machines, not listen to the latest soothing, futuristic electronica! With its lack of creativity in the artwork department and its reliance on just a single bonus feature, we really can’t see Flux winning many diehard fans. However, those who love free spins and simplified games should check it out! This game has a rating of 3 / 5 with 318 total reviews by the users.